The Allegiance of Thomas Hobbes offers a revisionist interpretation of Thomas Hobbes's evolving response to the English Revolution. It rejects the prevailing understanding of Hobbes as a consistent, if idiosyncratic, royalist, and vindicates the contemporaneous view that the publication of Leviathan marked Hobbes's accommodation with England's revolutionary regime. In sustaining these conclusions, Professor Collins foregrounds the religious features ofHobbes's writings, and maintains a contextual focus on the broader religious dynamics of the English Revolution itself. Hobbes and the Revolution are both placed within the tumultuous historical process that saw the emerging English state coercively secure jurisdictional control over national religion and thecorporate church. Seen in the light of this history, Thomas Hobbes emerges as a theorist who moved with, rather than against, the revolutionary currents of his age. The strongest claim of the book is that Hobbes was motivated by his deep detestation of clerical power to break with the Stuart cause and to justify the religious policies of England's post-regicidal masters, including Oliver Cromwell. 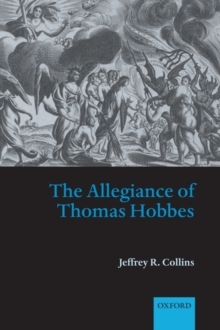 Methodologically, Professor Collins supplements intellectual or linguistic contextual analysis with original research into Hobbes's biography, the prosopography of his associates, the reception of Hobbes's published works, and the nature of the English Revolution as a religious conflict. This multi-dimensional contextual approach produces, among other fruits: a new understanding of the political implications of Leviathan; an original interpretation of Hobbes's civil war history,Behemoth; a clearer picture of Hobbes's career during the neglected period of the 1650s; and a revisionist interpretation of Hobbes's reaction to the emergence of English republicanism. By presenting Thomas Hobbes as a political actor within a precisely defined political context, Professor Collins has recovered thesignificance of Hobbes's writings as artefacts of the English Revolution.